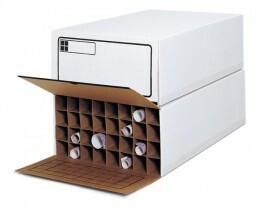 Safco Corrugated Roll Files - GS Direct, Inc. Corrugated fiberboard construction with wood side panels for extra strength. Stackable for high volume needs. Built-in tube length adjuster tabs let you customize tube lengths and store multiple size documents in the same file. Labeling grid on inside front flap for easy identification of contents. Maximum drawing length is 36"